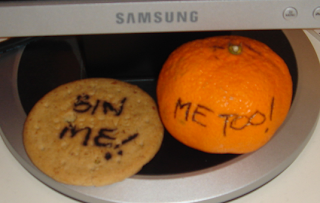 You may recall, in last week's thrilling installment of Rot Blog, someone defaced the biscuit with a 'bin me!' plea. During the course of this week, whether by the hand of man or some cosmic force of greatness, the satsuma followed suit. Now the two, forever joined together, struggle onwards to their final rotting destiny. The satsuma is now looking decidedly puffy; the biscuit, true to its carbohydrate rich roots, just sits there, ready for all comers. The saga, and the smell, continues.